Amy's Creative Pursuits: Digital Tuesday Challenge: "Music to My Ears"
What a fun fun Holiday creation...this is tooo stinkin cute!!!! Fab card Amy! Great card, Amy! So cute with the "hinged" arms & legs! Don't be so hard on yourself! You'll catch up! Oh, AWESOME card, girlie! You know I just LOVE Angels Landing...and what a perfect image for the challenge! Beautiful! 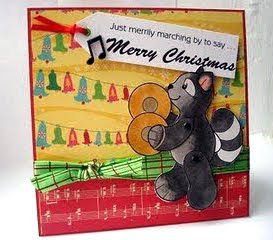 Very cute that you made a musically themed holiday card since there certainly is a lot of music around the holidays. I think that fact that you have made any Christmas cards up to this point is amazing and you're worried about not meeting your September quota. You have been so busy I can't imagine how you would have been able to get those done and your DT challenges and your card ministry cards and the ones you sell on consignment and still maintain a home and family and work. Dont' stress out about a couple of cards. If you want to make some super simple ones thought to catch up, you might want to check out the Clean & Simple blogs FTL63 sketch. A pretty piece of holiday patterned paper and a simple stamped sentiment and you could turn out a bunch of thse.